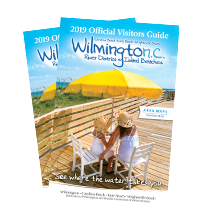 Wilmington, NC – As more vacationers seek accommodations that offer a more customized experience, Wilmington, NC, and its island beaches offer much more than conventional lodging options. Here, your accommodations can be as unique as the destination itself. Between Wilmington’s rich history, vibrant riverfront and the proximity of its beaches, there are endless ways to make your trip unforgettable. Here are just some of the unconventional and more intimate lodging options in Wilmington, Carolina Beach, Kure Beach and Wrightsville Beach. For a truly luxurious experience in historic downtown Wilmington, you can reserve a room at the Graystone Inn or The Verandas, Wilmington’s two AAA Four Diamond Award-winning bed and breakfasts, both located just blocks from the Riverwalk. Between the plush amenities and elegant breakfasts, you’ll have a hard time leaving your temporary home. The Graystone Inn was originally “The Bridges Mansion,” built in 1905 by the past president of the Atlantic Coast Line Railway, and you’ll revel in its turn-of-the-century grandeur while you enjoy nightly hors d’oeuvres by the fireplace in the elegant library. The Verandas, also a historical treasure, has been featured in many publications including Fodor’s Travel Guide, Frommer’s Travel Guides and Our State magazine. The four-story mansion is decorated with English and American antiques, and there’s even a piano for guests to play. The cupola on top of this inn is also one of the best places to get a panoramic view of historic downtown Wilmington and Battleship NORTH CAROLINA. History buffs should consider the Rosehill Inn Bed & Breakfast, a beautifully restored inn from 1848 that is “no ordinary B&B,” according to Southern Living magazine. Perhaps it’s the fact that this inn was once home to Henry Bacon Jr., the architect of the Lincoln Memorial in Washington, D.C.
Craving a more artistic experience? Consider The Wilmingtonian, a Wilmington staple surrounded by gorgeous 19th-century homes and tree-lined streets. This inn is made up of three distinctly themed buildings, including The Cinema House – decorated with a nod to film, which appeals to the movie stars, directors and producers who regularly stay there. The Wilmingtonian is also pet-friendly. For literary buffs, The Top Shelf – A Literary Loft is a vacation dream come true. If you’ve ever wished you could stay the night in a library, you’ll want to book this carefully curated loft located above Wilmington’s iconic family-owned bookstore, Old Books on Front Street. The loft is decorated with local literary masterpieces and even has a giant, walkable Scrabble board. If your stay includes a Saturday, you can take a literary walking tour led by the innkeeper/bookstore owner. Carolina Beach offers its fair share of rental houses and hotels to accommodate travel groups of all sizes. However, for a more unique lodging experience, you can check out two charming inns, each offering their own dose of original character. The Beacon House Inn Bed & Breakfast is pet-friendly and offers a casual and homey charm, with vintage photographs decorating the original pine board walls. Each guest room at this B&B has its own style, but all rooms reflect the “relaxed vintage beach vibe” that guests have come to know and love. The inn is known for its fresh, handcrafted breakfasts and use of local businesses and their products as part of their culinary program. For a more Caribbean feel, book a room at Mermaid Manor, made up of oceanfront suites. With knotty pine paneling, brightly colored walls and a harbor view, beach lovers will find vintage charm at this inn. For a relaxing vacation at Kure Beach, your lodging should feel secluded and serene. Explore Palm Air Realty’s many vacation rental options, each one as unique as the next. The Tree House is an especially adorable property that you might not know existed without an insider tip. This treehouse-inspired, second-floor beach rental features rocking chairs with an up-close view of the Kure Beach Fishing Pier. If you’re looking for a romantic escape with Kure Beach charm, consider Darlings by the Sea. This bright yellow lighthouse-inspired inn is the ultimate oceanfront retreat for couples, featuring oversized king beds, whirlpool baths and a breathtaking beachfront location. Wrightsville Beach is widely known for its adventurous watersports scene, but this island also has a rich history that is reflected in its one-of-a-kind lodging options. Only steps from the beach, you’ll find the Carolina Temple Island Inn, a hidden gem that faces the sound. This inn is made up of separate apartments and was once the home of Station 6, part of the Wrightsville Beach Trolley Line. The Carolina Temple Island Inn is a unique example of early coastal North Carolina architecture with central hallways, spacious wraparound porches, rocking chairs and hammocks. Also on the sound side is Creasy Cottage, the top floor of a breezy duplex with a large backyard and access to a shared dock. Creasy Cottage boasts the best sunset views at Wrightsville Beach, which is not surprising given its location. This is the perfect lodging option for a group looking to spend lots of time outside in the backyard or by the water. While vacation accommodations are often just the place you rest your head, with a little charm and creativity, it can be much more than that in Wilmington and its island beaches. One destination and four unique settings promise extraordinary experiences and unlimited vacation choices in Wilmington, North Carolina and its Island Beaches. North Carolina’s most accessible coastal destination is surrounded by water, history and natural beauty at every turn. From a 230-plus-block National Register Historic District, to colorful beaches – Carolina Beach, Kure Beach and Wrightsville Beach – each destination with its own distinctive personality is the perfect connection to see where the water takes you. For more information, go to WilmingtonAndBeaches.com or call (800) 641-7082. Find us on Facebook at Facebook.com/CapeFearCoastNC and Twitter and Instagram, @WilmingtoNCoast.